During the nine days we lived on shantyboats on Arkansas’ lower White River, shooting photographs for a book I was writing, we did not realize we were documenting a way of life—a unique Southern culture—that was about to end. Had we known, we might have appreciated our incredible adventure even more. It began in early 1998 when I signed a contract with Creative Publishing in Minnetonka, Minn., to publish Fishing for Catfish. The book was to be part of Creative’s Hunting & Fishing Library, a series well-known for its extraordinary photography. When we sealed the deal, publisher Don Oster told me to choose a place for the photographic work. Three members of his photography team—Mike Hehner, Dave Maas and David Tieszen—would accompany me. I knew immediately where I wanted to go: Three Rivers Country in southeast Arkansas. Here, two of the country’s biggest rivers—the White and Arkansas—converge with the mighty Mississippi to form one of the continent’s most productive fisheries for blue, flathead and channel catfish. At the time, it was one of the most remote regions in the South, but I knew an ideal place for our home base: a White River shantyboat town that would provide the perfect backdrop for the team’s photography. I fantasized about a shantyboat life as a kid in the 1960s. I fished with elder uncles then, catching crappie and catfish in oxbow lakes along the White and Mississippi. Every community on the rivers had its own shantyboat town, a collection of floating homes inhabited mostly by a poor, independent lot who eked out their livings through commercial fishing, trapping and shelling. Sometimes we bought bait from shantytown folks, or food or gas or a few buffalofish or catfish to take home when the fishing wasn’t good. Each time we’d visit, I’d think, what a wonderful life it would be living right on the water where you could fish out your windows! As I grew older, I cultivated the acquaintance of old-time river people whenever possible, and listened to their yarns with reverence. The simplicity and naturalness of their lifestyle fascinated me. While most of us lived in the chaos of a city or the monotony of a suburb, a life on the river seemed idyllic. It was a life without time clocks, without noisy neighbors, without rush-hour traffic. You could wake up in the middle of nature as the sun slowly illuminated the mist on the river and do whatever you felt like doing. Even as I thought this, I knew I was romanticizing what was a hard life with few physical comforts. And as I grew older and wiser, this youthful dream was abandoned. During the early 1990s, however, I spent many weekends at the White River shantyboat town where three old river-rat friends—Bill Peace, Ralph Griffin and Wallace Barber—each owned a shantyboat for extended stays in this catfishing paradise. It was here our team would live for nine days in July 1998 while shooting the catfish-book photos. In the 1930s, an estimated 500 people lived year-round along the lower White. Estimates for 1998 put that number at no more than five. 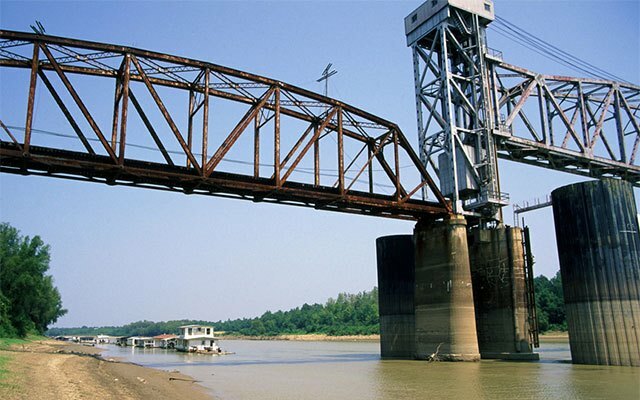 This included 65-year-old Leo George who lived on a shantyboat with his wife, Maxine, just upstream from the 100-foot Mallard owned by Bill Peace, and Bobby Wade, a 30-something commercial fisherman who lived with his wife, Linda, on a boat downstream from the old Benzal railroad bridge spanning the river. The Benzal shantyboat town dated back to 1876 when Calvin Tichenor of Indiana plied the rivers in a floating store selling goods to river dwellers. For a brief time in 1929, the U.S. Bureau of Fisheries operated a buffalofish hatchery on the banks here designed to increase Arkansas’ “rather depleted supply” of commercial fish. By the time Hehner, Maas, Tieszen and I arrived in 1998, nothing remained but a dozen shantyboats, weekend hideaways for all the owners except the Wades and Georges. The locale was ideal, but conditions were not. The photo team had driven from Minnesota, pulling a big flatbottom boat loaded with gear. Unfortunately, the river was more than 20 feet higher than normal, and backcountry roads that normally provided access were flooded. We had to launch several miles upstream and motor down to Benzal, which sits 7.6 miles above the confluence of the White and Mississippi. When Maas, whose job it was to operate the boat, first laid eyes on the roiling water, he gasped with trepidation. We docked in the boat slip on the end of Ralph’s shantyboat where we were greeted by Ralph, Bill, Wallace and their friend, Claud Smith. Everyone got acquainted over a dinner of fried catfish, buffalo ribs and all the fixings Ralph had prepared. Then the flatbottom taxied each of us to the boats where we’d sleep. “This is perfect,” chief photographer Hehner told Ralph as we laid plans for the days ahead. “We don’t have to launch a boat and take it out every time we shoot. Just throw the gear in and go. “Here’s another good thing,” Ralph said, grabbing the handle on a winch mounted to a deck post. He strained to turn it, raising a gigantic metal box submerged in the river beneath the boat. When it cleared the water, water poured from holes in the sides and a loud thumping ensued. “Open it,” Ralph said to Hehner. Mike did so nervously, but smiled when he gazed inside at several catfish weighing more than 20 pounds apiece. The Minnesota boys, unaware they’d been set up, had looks of astonishment on their faces when pot-bellied Bobby—all 5 feet and 300 pounds of him—stepped out of his johnboat wearing a Goofy hat with long floppy ears, fluorescent-yellow knee boots and brightly colored Speedo briefs. Have fun we did. Most of our time was devoted to fishing for the rivers’ abundant catfish, then setting up photographs to show each bait and technique used to catch them. Ralph’s experienced crew assisted, showing their methods for catching cats on rod and reel, trotlines, limb lines and even jugs. We caught plenty of whiskerfish, but no 100-pounders. Tieszen, up to his neck in the river, modeled for noodling photos with our biggest catch: a 27-pound Mississippi River flathead. Each day and night held something special. We caught high-jumping gar as long as cannons, and plentiful crappie and bream for dinner. We sat on moonlit sandbars watching Dixie paddlewheelers steaming past and saw black bears and deer ‘round every bend. During our final hours on the river, Tieszen provided a grand finale none of us would forget. Each day that week he had climbed up on the old Benzal bridge, more than 100 feet above the water, and tried to muster the courage to take a plunge. Each time he chickened out. As the time neared for us to leave, however, we sat on the river in boats and watched as Dave climbed again to the lofty railroad tracks, stood briefly at the edge, then jumped and executed a perfect cannonball. When he surfaced, unscathed, cheers went up all around. The river rats we lived with that week shared stories of adventurous lives that made us wish we could escape our humdrum lives and live on a shantyboat. Little did we know that soon the shantyboats would be gone. For more than a century, people had lived and died in this little corner of the world, asking nothing more than to be left alone. But the year after our adventure, the federal government gave notice to the final five people who lived year-round on the shantyboats they would have to go. All the boats owners, including Ralph, Bill and Wallace, were ordered to move their boats elsewhere. Folks say Leo and Maxine lived their final days in a nursing home. Bobby Wade moved his boat to a private backwater downriver but had to move to a house in town recently after being diagnosed with multiple sclerosis. Sadly, with the shantyboats went the wilderness. Where once the White River flowed freely into the Mississippi, there now is a massive $250 million lock and dam built by the Corps of Engineers. The vast bottomland forest once home to countless bears, deer and other wildlife was cleared to make way for a highway. The landscape of Three Rivers Country is gutshot, and the once quiet rivers are noisy waterways with incessant boat traffic. Gone are the rugged, independent people who comprised a unique American culture as much a part of the river ecosystems as the fish. When the shantyboats had been moved, someone—no one in the river bottoms will say who—set the wooden ties on the Benzal Bridge on fire in the middle of the night, a river-rat protest against everything new. I wish I could have been there to see it burn.